Rhoda Eastham MacDougall, aged 20, shortly after marriage in 1916. With her are her brothers, Harold and Arthur. 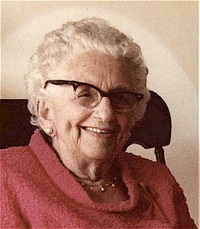 She had an incredible memory right up until her 95th year. Fortunately we have some of her thoughts, memories, etc. preserved on tape. Rhoda Eastham (1895 - 1990) is the daughter of Eliza Annie Qualtrough and William Darbyshire Eastham. (See Chart 14 in A QUOTA OF QUALTROUGHS) The family of Eliza Annie Qualtrough and WD Eastham were all born in Douglas, Isle of Man, before they emigrated to Calgary, Alberta, Canada about 1911. 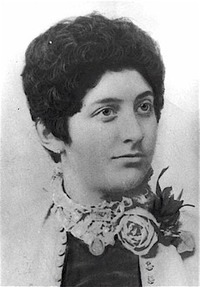 Rhoda Eastham married JD MacDougall and together they had nine children on Prince Edward Island and Calgary, Alberta, Canada. Memories of Mom(Rhoda Eastham MacDougall) and her memories of her childhood via a tape in 1986. Also including our visit to Isle of Man and recalling Mom’s memories as we visited. Mom was a most patient, kind, good natured and caring person with always a smile. 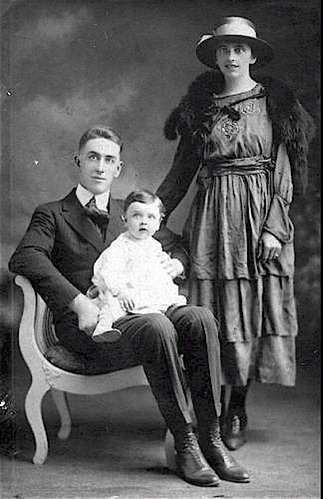 Life for her was not always easy ;raising a large family during the depression, so far removed from all of her roots. However she had the love and support of our Dad, with his warmth, forsight and keen sense of humour with which she was also blessed. With nine children, who were not always saints, one needed a good sense of humour. Even so our home was never lacking in love and laughter. Mom told us many stories of her childhood. She was either talking about her childhood or singing. She was a member of a Presbyterian church choir for many years. 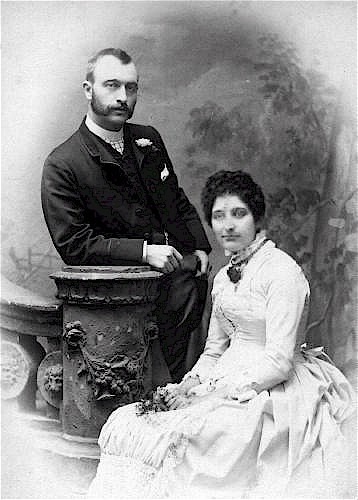 Eliza Annie Qualtrough and William Darbyshire Eastham who were married in Wigan, England. They were the parents of Rhoda and several other children. Just before our visit to the Isle of Man in 1976 I asked her to recall again for me features of her home, location, landmarks, etc. On arrival we found, to our amazement , that virtually nothing had changed; it was exactly as she had described it, in detail, and all landmarks were easily found. She told us about her home at 21 Kensingston Rd. Douglas, a three story, semi detached red brick building with five or six bedrooms, a rose garden enclosed by a wrought-iron fence with ivy climbing up the posts. There it was in 1976 standing tall and proud; it was as if time had stood still .It was a very moving moment for me to walk over the "brass" threshold which she had told us was her duty to polish each Saturday morning. The occupants were most gracious and invited us in to enjoy. She attended St. Thomas Anglican Church school on Crellins Hill. This still stands. The, principal was Mr. Leese. Mr. Green and Miss Kline (?) were also teachers. Later she and her sister Mabel, went to a Private Ladies School where she states she was taught Academics plus "how to be a lady"; also singing and sewing I believe. This cost was "tuppence a week". She and her mother and siblings went to Rosemount Methodist church which was" at the end of our St."This is where she got a gold medal for memorizing all the Books of the Bible This ability she retained until her death, much to the amazement of several clergy. Her father went to a Baptist church. Following her directions "down the hill, etc." we easily located these churches. She told us about a private tennis court across the street; there it was! 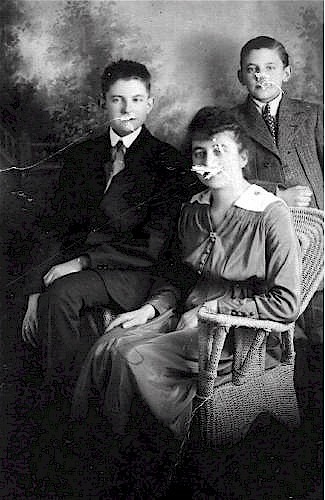 Eliza Annie Qualtrough Eastham with her sons Harold (left) and Arthur. One of her happy memories was visiting her Grandma Qualtrough,(ie. Eleanor Gawne Qualtrough) Auntie Louie and Auntie Kate at "Morea" Albany Road. It was "round the corner and down the hill"- and so it was. Auntie Nellie had died but she had two children Pansy and Harry Wade. Harry, I believe went to England. My sister Margaret Anne (called after Grandma Qualtrough Eastham) and her family visited Morea ,Albany Road, while Auntie Kate and Pansy were still living there. They found it all most interesting and learned some things first hand regarding the illustrious Qualtrough clan. They visited the Manx Museum where a Mr. Qualtrough was the curator. They were informed that the Qualtrough family was quite influential on the Island and owned several industries. My brother, Gordon and wife Joan, also visited the Isle of Man more recently. They found things were still as Mom had described. An interesting observation for us was that these two houses ,"Morea" and the one on Kensington Road, were the only two red brick houses that we saw in Douglas. Something that always fascinated me was that the houses had names. We later owned a cottage on P.E.I. (Prince Edward Island, Canada). and called it "Morea". Again the young couple who occupied "Morea" made us feel most welcome. Mom’s Dad ,William D. Eastham, owned a coal importing and distributing Co. called "W.D. Eastham" on the Quay. His father, Luke Eastham and Grandma lived near the Promenade. William Eastham’s brother-in-law, Harry Brown, owned a hattery on the Strand-or Main Street. She talked about going to Ramsey for holidays. Her mother and children would go. They would have a Sunday school picnic at Laxey Wheel. They would go by sharbangs which was a wagon pulled by four horses, and would take about three hours each way and cost six pence each; these are still present on the Promenade. Eliza Annie Qualtrough. She was the daughter of William Qualtrough (Shipbuilder of Douglas, Isle of Man) and Eleanor Gawne. William and Eleanor were married in Geelong, Victoria, Australia, in 1856. They later returned to Douglas, Isle of Man. We visited the Promenade and recalled a humorous incident she had talked about. It seems a Punch and Judy show was taking place and offered a prize for a pie eating contest. Mom and her sister very quickly participated but alas, just as the contest was about to begin her older brother Wally, just happened along and just as quickly removed them. It seems this incident had brought disgrace on the family but gave us many laughs over the years. While we were in the Isle of Man we visited with a cousin Betty Crystal and her son Edward in Ramsay. Betty was Wally and Mary Eastham’s (Wally Eastham was son of Eliza Annie Qualtrough & WD Eastham and an older brother of Rhoda Eastham) daughter and she had come from Calgary, as a very young girl, to look after her grandparents-on her mother’s side, I think. She married there and didn’t return to Canada. Betty was a very interesting lady and a most gracious hostess and we continued to keep in touch until her death a few years ago. Before leaving for Canada Mom apprenticed at a Post Office where she says she learned Morse code, how to send telegrams, etc., etc. This I believe was just before she was sixteen as she came to Canada at that age. Mom talked about them coming to Canada. She says "Dad was not anxious to come", but Mother felt "there would be more opportunity for the boys". ‘Twas ever thus, eh? Mom’s older brothers, Wally and Stanley, I believe, had already gone to England for training and then they went to Canada. Wally was a druggist and Stanley an optometrist - as I recall. The family came to Canada by boat landing in Montreal. (about 1911). She knew the name of the ship but unfortunately it was not documented. They then went to Winnipeg by train but they didn’t like Winnipeg so moved farther west to Calgary where her brothers had a home waiting for them on Hillhurst Street. Mom says she liked the Canadian men, "they were nice, they wore "Peg-topped pants". I guess to-day that would be considered "cool". On arriving in Canada she states that her mother was lonesome,-having left all her people. Her Dad was not too excited about Canada either, having given up his own Company and here he worked in a Trust Company but their family all loved their new Country. I believe Mom’s mother (ie. Elizabeth Annie Qualtrough Eastham) only lived a few years after coming to Canada and died during a flu epidemic. Mom also had the flu at this time and both were being taken care of at home by two nurses. She sadly recalls that morning when her nurse came into the room and said, "your mother’s gone dear" and she remembers her mother being carried out of the room. 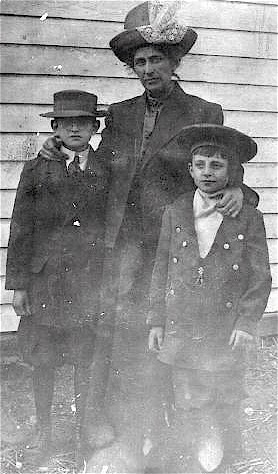 Rhoda Eastham MacDougall, her husband John D.(Jack) MacDougall and their eldest son Lorne. Photo taken in Calgary, Alberta Canada about 1920. The family attended First Baptist Church in Calgary but she later attended Westburn Baptist Church ,12th Avenue 4th Street West which is where she met my Dad, - John D. MacDougall. He was in the Canadian Armed Forces at that time. Mom talked about bringing her boy friend home to meet her father, with some apprehension, as I believe her father was very stern. They decided to get married as Dad was being assigned overseas and the night before he left they were married in Medicine Hat Alberta on June 25 1916. Needless to say the honey moon was brief-one night- Spent at the YWCA and Dad left for Europe the next morning. While Dad was overseas Mom worked at an exclusive private club in Calgary called The Ranchman’s Club whose membership boasts of former prime ministers, premiers and oil tycoons; this club is still very much in existence. She was a book-keeper and receptionist, I believe. After Dad’s return to Canada they decided to go back to PEI -his birth place (Prince Edward Island) as his parents were getting older. Again this was a huge adjustment for her as she was a city girl and they were living in the Country. Their oldest son, Lorne, was born on PEI. She missed her family and friends in Calgary and so they returned there for a few years where Roland was born. Roland’s death ten years later from osteomyelitis was felt very deeply by Mom, Dad and our whole family, especially now when one considers a shot of penicillin would have prevented his death. Mom says she felt her husband should be "with his family" as he was the only son and so they returned to PEI once again where they lived until Dad’s death on January 20, 1972 and where a total of eight children were born to them. (Roland was born in Calgary). Wow! Nine! Lots of fun! Mom grew to love PEI and its people and she was loved and respected in return. However she never completely lost that beautiful soft Manx accent which we frequently kidded her about, and she always spoke most correctly. After Dad’s death she moved to Ottawa, Ontario, where several of her family were living. To have Mom living near us once again gave us an opportunity to really get to know her as adult to adult. She lived in Ottawa for eighteen years and that was a wonderful experience for all of us children, as well as her grandchildren. We had many family get to-gethers with family coming from East and West as well as U.S.A. The grandchildren all adored her and it was a given that whenever one of them were serious about a girlfriend or boyfriend they had to be taken to meet Granny first. Even the grandchildren’s friends all referred to her as "Granny". She kept her beautiful smile with those lovely big eyes, her sense of humour and her keen mind with her to the end - at ninety five years young.